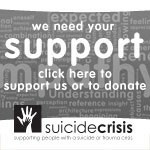 If you would like to donate to our charity, you can click on the MyDonate button on this website, or via JustGiving: https://www.justgiving.com/suicidecrisis. Facebook – we have now signed up to receive donations through Facebook; you can see the “Donate” button, for individual donations, on our page. You can also start a fundraising campaign and invite friends to contribute. You may get a message from Facebook about creating a “birthday fundraiser” as your birthday approaches, but you can start one at any time at https://fb.com/fund/SuicideCrisisCentre. We are very grateful to all those who have donated this way already. Amazon Smile – you can ask Amazon to donate to Suicide Crisis a small amount from any purchase you make, at no cost to you. Just remember to use the website https://smile.amazon.co.uk/ rather than the usual https://www.amazon.co.uk/. The first time you visit the site, you will be asked which charity you want to support – search for Suicide Crisis which will appear as “Suicide Crisis Cheltenham EW”. You can change which charity you support whenever you like. Tip – if you download the ‘donation reminder’ to you browser, this links direct to your favourite stores and ensures that a cost-free donation will be made on all your purchases without further action. See http://www.giveasyoulive.com/install. Events – another way to raise money is to enter a sponsored challenge. You can sign up for an existing event and arrange sponsorship money to paid to us http://www.btplc.com/mydonate. Alternatively, we are registered with http://www.charitychallenge.com who provide a wide variety of possibilities. You may choose to do one yourself or encourage a friend, colleague or relative to participate. We would love to hear from you if you are interested in volunteering. There are many ways in which you can help us and our clients, so please use the ‘Contact Us’ facility on the website to get in touch. We sometimes have vacancies for volunteers to be members of the Suicide Crisis team, supporting clients on a one to one basis. You need at least level 3 counselling skills for these voluntary roles. Currently all but one of our team are fully qualified BACP-accredited counsellors. You’ll also need to be prepared to undertake further training specifically to support clients who are at risk of suicide. Within our charity we have a number of clinical advisers, including an advising psychiatrist and the former co-clinical lead of an NHS psychological therapies service. We are hugely grateful to them for the wonderful and speedy advice which they provide. It may be that you feel you could contribute as an adviser. In addition, we sometimes need additional volunteers to provide clinical supervision to members of our team. Our current supervisors include the lead clinician of a psychological therapies service and two supervising counsellors. All of them are experienced in providing clinical supervision. You may have some other skill, ability or professional expertise which you could contribute (management, publicity, legal knowledge, clinical knowledge, communications, media liaison, computer skills, event organising or driving to take members of our team out to visit clients). We like to create roles around people’s individual qualities and experience, so if you feel that you have something specific to contribute, please let us know. We are very grateful to the lawyers who have provided free help to our clients, in many different situations. We are always happy to hear from lawyers. Special thanks to Steven, a very experienced London barrister, who is representing bereaved families at inquests in Gloucestershire, as a result of our concern that families are rarely represented.